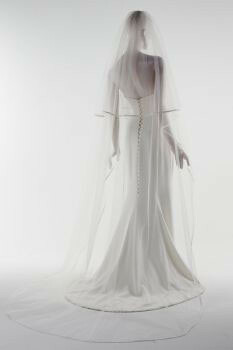 The Sarah Veil from The Couture Veil Co.
'Sarah' refers to a two tiered veil; it has a blush layer (the bit that comes forward over your face). Just because you have that layer doesn't mean you need to wear it forwards; it adds a lovely bit of extra volume on the back. Plus it means you can make that decision on the day!